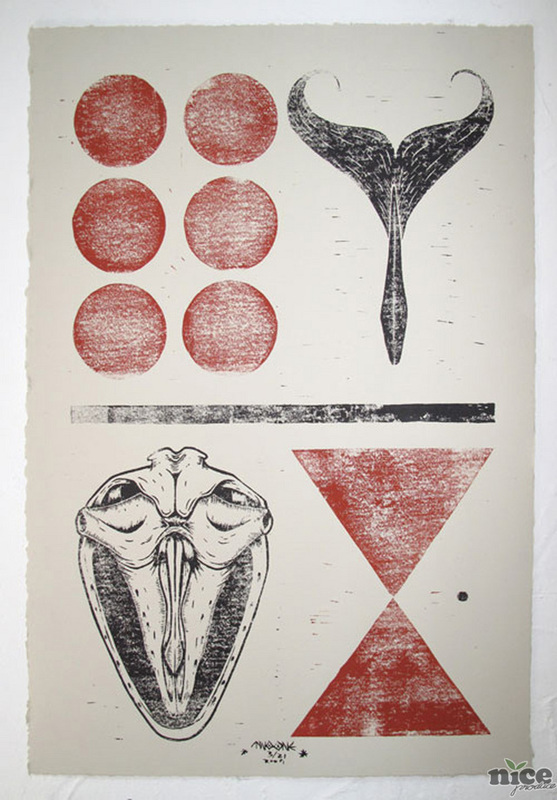 "diagram of the Whale" Lino Print As Featured in "engraving" Twoone's Lino Print Exhibition at Gorker Gallery Melbourne in Early 2010. Twoone is an Artists Who's Work Commands a Certain Kind of Intrigue from It's Audience. His Craftsmanship, Patience and Instantly Recognizable Decorative Style Resonates a Flowing Narrative, Portraying a World of Spiritual Tranquility That You Can't Help but Wish to Be a Part Of. He is an Artist Whoâ€™s Quiet Voice and Kind Nature Are Conflicting to His Success, His Artwork Speaking for Itself, with Features in Some of Australia's Premier Art and Design Magazines and Exhibiting with the Likes of Graham Base in February of 2010.